Personal Branding is not a one and done exercise, it is a process. This guide is intended to help you lay the foundation for the development of your personal brand, so that you may stand out among those who possess the same qualifications you do. or are you pushing them away without even realizing it? Being successful in business and in life can be boiled down to a series of opportunities; you’re either being presented with them or you’re not. How can anyone expect to get ahead if doors don’t open, invitations aren’t sent, or introductions aren’t made? Through the development of a strong personal brand, you increase your visibility with the people who need to know about you, and strengthen your credibility by demonstrating the value you bring through everything you do and communicate. All you must do is send clear and purposeful messages through both verbal and non-verbal communication. This will ensure that your skills, knowledge, ideas, and voice get the attention they deserve. To maximize your personal brand’s effectiveness, make certain that your verbal and non-verbal messaging are in alignment with who you are, and that with which you are associated. This will improve the likelihood that you will make the long lasting favorable impressions you need to attract the opportunities that will get you to where you want to be. They make certain everything around and about them is on-brand. 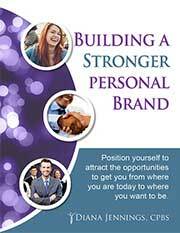 Want to know the strength of your personal brand?